Seaview is a pretty coastal village situated on the north-east coast of the Isle of Wight and a great place to enjoy a self catering holiday. Under five miles to the south of the popular family resort of Ryde and four miles to the north of Bembridge, the village is a welcoming and relaxed place to stay. You will be forgiven for thinking that you are in Cornwall when you visit Seaview as they are so similar. There are many self catering holiday properties in Seaview on the Isle of Wight. Seaview was originally made popular as an upmarket Edwardian seaside resort, it still retains a sense of exclusivity and is popular with both locals and holiday makers. Summer time is especially busy both on land in Seaview as well as out on the water. With its lovely sandy beaches and spectacular views across the Solent to the famous Solent forts as well as Portsmouth and the Spinnaker Tower beyond, it is one of the nicest places on the island for a relaxing self catering holiday. If you fancy a treat, why not head to The Seaview Beauty Clinic, they offer a number of treatments ranging from simple waxing, facials and massages to full on pamper packages that will leave you feeling like you are walking on air. There is a local chemist that also houses the post office counter, a lovely little shop called Bookworm, this shop sells the best cards for all occasions, beach toys and lots of other lovely things. There is a local village shop that sells lots of lovely local Island produce, a shop selling Billtong, a couple of pubs and a lovely café called Lily’s that serves the nicest food and cakes. Head to Lily’s for a morning coffee and you will not be disappointed, you will return time and time again – their menu is brilliant, the food is great and the service is always with a smile. A beautiful beach that is known for being the most popular or the area, partly due to its gently sloping sands which are ideal for swimming or beach games when the tide is out. From here you can walk along the sea wall from Seagrove to Priory Bay Beach which is a very popular sandy beach with great views. It is also used as a launch platform for boats as well as being the ideal place for watersports. For those who like to spend time out on the water, Seaview is a perfect choice and has a welcoming yacht club. Known for having some of the best views on the island, with a panorama including Portsmouth and the Spinnaker Tower and the famous Solent forts, Springvale is the perfect place to spend lazy days at the beach. Stretching from Puckpool to Seaview, it is a mixture of sand and shingle and the gradient of the beach makes the almost crystal-clear water quite shallow at both low and high tide. This undiscovered gem is perfect for those looking for a secret hideaway away from the crowds. Built within a former Victorian Fortification Battery, and situated to the rear of Springvale Beach, this park makes a lovely family day out. There are tennis courts, mini-golf and a children’s play area, and beautiful gardens to walk around or relax in if you are looking for a little tranquility. If you are peckish, there is a great Tea Garden Café where you can take a well earned rest or stroll on a little further to The Deli Café where the crab sandwiches are apparently the best ever! The popular seaside town of Ryde is only a 10 minute drive from Seaview, known as the ‘Gateway to the Island’ the beach is lovely and sandy, it has a bowling complex as well as vineyards on the towns outskirts in a place called Ashey and various activities to enjoy such as go karting and golf in the Westridge area.. Ryde town has a great selection of independent shops to browse amongst if you are looking for some great gifts to take home. Ryde has many bars and eateries for you to visit and enjoy some scrummy local Island produce. If you fancy something a little more cultural, the beautiful Quarr Abbey is located just outside Ryde on the way to Binstead towards Newport and there is a lovely café to enjoy some tasty treats. Seaview is situated 5 miles to the south of the popular town of Ryde and 4 miles north of the village of Bembridge. 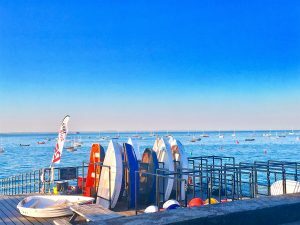 Just over 15 miles to the popular town of Cowes, it is 10 miles to the capital town of Newport and just under an hour away from the popular Needles Landmark Attraction and Tennyson Down on the western tip of the island. A visit to the West side of the Island is a must with its beautiful beaches and cliffs. If you would like to visit this pretty seaside resort, why not have a look at our selection of self catering holiday properties in Seaview? Here you will find the perfect base to visit this lovely area and all it has to offer. Follow us on Facebook for our local tips, special offers and Isle of Wight information.